After seven years, this beautiful condo tower is almost 75% sold. ...Opened in 2010 during the worst of the Great Recession, Museum Tower was slow to take off. A nasty fight with the neighbors - the Nasher Sculpture Center - also held back sales in the early days. But now real estate agents who are selling the remaining units in the silver-glass high-rise at Woodall Rodgers Freeway and Pearl Street say its almost 75 percent sold. The remaining two dozen or so units in the tower are priced from $1.25 million. Still up for grabs is the 8,449-square-foot penthouse which is listed for sale at $16.5 million. Rather than saying "a nasty fight with the neighbors - The Nasher Sculpture Center..." I would have called it a debilitating struggle to avoid municipal responsibility. Without this "nasty fight," this condo building could have been almost sold by now. Bloated, contemptuous bosses soiled the Arts District, and the "new" leaders continue to lessen the potential of the Arts District as long as the reflective glare inhibits activity at The Nasher Sculpture Center. Oh lord, that's some melodrama. This tower is helping to make the Arts District. Thank goodness it was built! It's hilarious to see the spin the Museum Tower marketers put out; but seeing it from a supposed real estate reporter is pathetic. Blaming the slow sales at Museum Tower on the "Great Recession" is ridiculous. Steve seems to have even moved the opening of the building to make it a little closer to the so-called Great Recession. A few facts: (1) The "Great Recession" ended in mid-2009, so 2010 was hardly "the worst of the Great Recession"; (2) Museum Tower did not open until December 2012, 3 1/2 years after the end of the Great Recession; (3) the "Great Recession" had very little impact in the booming DFW area anyway. Blaming the slow sales on the reflection issue is almost as silly. It's not as if sales were going along at a brisk pace until the reflection issue became apparent. Far from it. Museum Tower sales were (and are) slow because it was some combination of too much product at the wrong price point in the wrong location. Of course every serious person who had looked at the project for the ten years prior to its opening knew that. That is why the project could only happen when the police and fire pension fund "invested" other peoples' money. I would have preferred it hadn't been built. It's the biggest reminder of the massive collapsing Dallas Fire Police Pension Fund which could still bankrupt the city but that's really a minor thing cause we got another shiny object out of it. Big Things Happen Here! including financial mismanagement and municipal collapse. October 2016 They sold two more condos in October. November 2016 Zero sales in November. Four years and counting. December 2016 Museum Tower sold another three units in December 2016. I think this brings them up to 75 sold, only 40 left. 65% sold 49 months after the building opened. They continue to plug along right at the 1.5 per month pace. IF they can continue this pace of sales, they would be sold out in a little more than 26 additional months. FWIW, the penthouse is still available. January 2017They sold zero units in January. I think they are at 75 sold and holding. Averaging exactly 1.5 sales per month in the 50 months since opening. IF they can continue that pace, they would sell out in April 2019. February 2017It looks like Museum Tower sold two more units in February! 77 sold. Only 38 left. At this pace, they may sell out in April 2019 (6 years, 4 months after opening). March 2017 Zero units sold. They stand at 77 sold in 52 months. 38 remaining. Plugging away at the pace of 1.48 sales per month. Now heading toward May 2019 for a projected sell-out date (IF they can maintain that pace of sales). April 2017 One unit sold. They stand at 78 sold in 53 months. 37 remaining. Plugging away at the pace of 1.47 sales per month. If that pace of sales can be continued, we are heading toward a June 2019 sell-out date. May 2017 THREE units sold. They stand at 81 sold in 54 months. 34 remaining. That brings them back up to their long-term pace of 1.5 sales per month. Last edited by Tucy on 01 Aug 2017 14:01, edited 1 time in total. Zero Museum Tower units sold. 81 sold in 4 years & 7 months. 34 more to go. Thanks for the constant updates! Ross Ave seems to be picking up steam, but another slow month of Museum Tower. 84 sold in 57 months. 31 remaining. 85 sold in 58 months. 30 remaining. 6 years, 7 months from completion. Last edited by Tucy on 16 Oct 2017 13:23, edited 2 times in total. 29 of those units are also going against 6 on the market by their first owners. 86 sold in 59 months. Inching up on the 75% sold mark. 29 remaining. Sellout projection: 6 years, 7 months. Sorry, can't let you re-write history like that. Museum Tower was an abject failure long before the reflection problems were known. Decision making of the Pension Board is a failure, I would even say criminally negligent, but the building is beautiful, the units are top of the market (South Central US) and they'll eventually sell out. It's taking a long time to sell these units, and many places would have lowered the price; these units stay extremely expensive, comparable to the most exclusive parts of Highland Park and Preston Hollow. I figured it would take five years - typical forum optimism from me for sure; it'll end up taking seven to reach 90%, and the last unit or two may take a decade. I'm not rewriting history, I'm just remembering the most important detail, just because it does not show up on a spread sheet doesn't mean it's not a deal. but I cannot prove the sun reflecting off Museum Tower into the galleries of The Nasher Sculpture Center staggered condo sales any more than you can prove the glare has nothing to do with it. Maybe someone will try to quantify the opinions of the philanthropic community - those who could afford and seek a million+ dollar residence inside the Dallas Arts District - and answer the glare question. sure the building is pretty and will eventually sell out. But as a business venture/investment, it's pretty hard to argue that it is not an abject failure. Your own use of the words criminally negligent kinda proves the point. And I know you love your strawmen, but of course I never said that the reflection issue did not hurt sales. I'm sure it did. It is absolutely ahistorical to claim the building failed due to one itsy-bitsy little flaw. And the reflection issue is not the most important detail in its story of failure, by a long shot. Okay then, what is an abject failure? Park Cities are the epitome of white flight, does that tarnish the abject success of the neighborhood? Of course, but it's not on a dollars and cents spreadsheet. I guess the Texas Rangers are also failure since they've never won the World Series? not abject since they've been to the series... and lost. I would say the building is an abject failure specifically because it diminishes the Nasher Sculpture Center, a cornerstone of the Arts District. Not an itsy-bitsy little flaw. tamtagon wrote: Okay then, what is an abject failure? Park Cities are the epitome of white flight, does that tarnish the abject success of the neighborhood? Of course, but it's not on a dollars and cents spreadsheet. I think a lot of people here measure success by the existence of a new shiny shiny and not the impact or value of the project itself. So the tower is built, it's almost completed, is that success when it is almost certainly already unprofitable and by some rough but fair estimation losing at least $112,000 a month in carrying costs BEFORE interest. Average sqft of the building is 1800 sqft, HOAs are at $.77 a sqft so $16,632 a year in HOA, another $22,000 a year in property taxes based on DCAD, insurance will run you another $6,500. So basically without interest costs that 1,800 sqft unsold unit costs the developer $45,000 a year before interest to sit empty. Off topic from Museum Tower, but I'm not so sure the Park Cities are an abject failure in terms of Dallas. Yes, we don't get all that property tax money. But I think it's plausible that if that area didn't have its own municipalities/ISD, you would've seen legit white flight from that area to the 'burbs during the 60's-90's. Instead, it kept a significant source of wealth/power close to the center. Executives living in HP want to work nearby in Uptown/VP. So while not ideal, there are definitely worse alternative universes. Back to the tower itself, I'm very glad it was built and can't wait for more towers like it! 2 units sold. 5 years in and they have surpassed the 75% sale mark. FWIW, 75% sold is about the level of sales that successful condo developers plan to achieve before construction is completed. 88 sold in 60 months. 27 remaining. Sellout projection, based on the pace of sales thus far: 6 years, 7 months. Hopefully, one day, this pretty black eye will heal. eburress wrote: Back to the tower itself, I'm very glad it was built and can't wait for more towers like it! Yes I agree in the end it will be sold up and hopefully many more get built. Let's see how Hall does with his condo tower. Tucy, in your expert experience..how would you describe the Dallas Luxury Condo Market? Typically, How quickly do these type of condos even sell out in Dallas? I know you threw out some numbers of what successful condo towers pre-sale figures look like. But is that true for Dallas? In my humble opinion, Dallas seems somewhat unproven with this type of product. I wish there were more reasonably priced midrise and highrise condos in Dallas for young professionals and such. The Ritz complex was also very slow as well. I believe Tower One above the hotel took a good 6-7 years (give or take a few months or so) to sell-out or nearly sell-out before sustaining high-ninety percentile turnovers of move-outs/move-ins. Tower Two had a slightly faster fill-up even with more units. Regency Row 1-4 is 25% occupied, though. I suspect it'll never be more than 75%. That one unit next to the loading dock should be an office-condo rental of some sort. Something creative perhaps. There is only one residence left available between both towers. It does not include Regency Row. If the tower had sold out quickly we'd all be tsk tsking about how they did a firesale at a loss just to get rid of the thing. Instead, they choose to maintain their margin and do a slow burn on the sales so we tsk tsk about the slow rate of sales. I see absolutely nothing wrong with Museum Tower choosing to make a healthy profit on each unit and selling them slowly as a result. It's much better than the alternative. Yeah, it doesn't seem the MT people are nearly as worried about their sales as are people on this forum. Because if Museum Tower people were worried in any way they would vent their feelings on this forum and to the press so that must be that nothing is wrong. f4shionablecha0s wrote: If the tower had sold out quickly we'd all be tsk tsking about how they did a firesale at a loss just to get rid of the thing. Instead, they choose to maintain their margin and do a slow burn on the sales so we tsk tsk about the slow rate of sales. I don't recall anyone ever complaining about their sales strategy [i]vis a vis[i] discounting to sell out fast, vs maintaining prices (not that any of us actually know to what extent they have offered discounts). The problem with the building was the decision to build it when everyone who had ever looked at it knew it was bigger/more expensive than the market could bear. It is laughable to think they are making a healthy profit on any unit, let alone on every unit. "Profit" and "Museum Tower" do not belong in the same conversation. Last edited by Tucy on 11 Dec 2017 09:56, edited 2 times in total. eburress wrote: Yeah, it doesn't seem the MT people are nearly as worried about their sales as are people on this forum. You cannot be serious. Are you really unaware of the serious financial situation the "MT people" got themselves into; the firing of the top guy, the bankruptcy threat it posed to the entire City of Dallas, the need for special legislation from the State of Texas to bail them out? Taxes, insurance, HOA operating costs, interest, those unsold units are burning money every day they are unsold, by my math the average unit sitting on the market for 5 year has burned through $225,000 just to sit empty before interest payments. You might as well give the buyer a discount if you are throwing $45k a year into the furnace now. I'm aware of the building's history, its neighborhood disputes, etc. My point is more about the piling on, rooting for failure (as if it makes the building's detractors feel more "right" or validated), and/or the "I told you so" ism that continues to happen. It just doesn't seem very constructive at this point. I (and I’m sure many others) appreciate the monthly updates, Tucy. It always impresses when someone rhetorically asks “I wonder how well that building is doing” and I can answer with some seemingly-insider info off the cuff. But, perhaps more intriguing, how do you get this scoop?! I totally agree with your comments ... after 5 years of this person's monthly droning on and on about the negatives it is time to give that tired, tedious and boring dialogue a rest! Reporting on sales numbers is one thing that people can appreciate ... but the constant negativity exhibited by this person borders on a sad preoccupation. Plagiarizing a famous quote: "What difference, at this point, does it make?" Museum Tower is Now 80% Sold Out. Boom. Museum Tower has hit a crucially important sales milestone: 80% sold. Which means 100% is in the very near future. In high rises, sales multiply more rapidly with every signed contract. Currently there are 108 homes, after legal combinations of units, and only 22 homes left to sell. The 42-story luxury tower is now five years old. And for Steve Sandborg, Managing Director, Sales and Operations, this sales threshold couldn’t be a better holiday gift. The Ritz, with the exception of the Townhomes, is sold out of new inventory and onto re-sales. Craig Hall is just breaking ground on Hall Residence Arts Center (stay tuned). Bleu Ciel is nearing completion, but it’s in Uptown, a different vibe than MT. With homes starting at $1.25 million, or about $800 per square foot, any real estate savant knew the building would not sell in a two or three year time period. Other developers have been watching MT for a long time, says Steve, and if they have designs to offer a similar level of service, that’s a form of flattery. After all, Museum Tower drove a new $800 psf price point in Dallas real estate, in a town shifting from a spread out single family home model to dense, urban luxury living. LOL. That's some funny stuff there. Is Candy auditioning to take over Museum Tower marketing? Tucy wrote: LOL. That's some funny stuff there. Is Candy auditioning to take over Museum Tower marketing? I mean... she makes a fair point. These are $800/sqft residences, in a format that is not your usual Highland Park/Preston Hollow mansion style which has been the historical choice of home for the well-to-do. If someone opened up a neighborhood of 108 brand new $800/sqft single family residences in Dallas, all at once, how long would it take to sell out? I'm guessing at least a few years if not more. 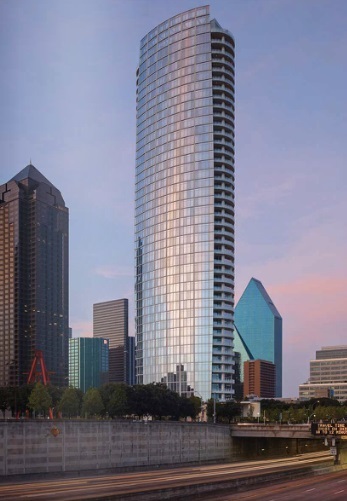 We shouldn't gauge the whole Dallas condo market from the sales figures of this one ultralux tower. If a 108 unit condo building opened up at $300-400/sqft, I think we would see faster sales. Well I guess this answers what I initially asked Tucy. Dallas is unproven when it comes to High Rise, ultra luxurious condominium living. But MT gives us a good gauge of what amenities, locale, pricing etc. is expected by the market and more importantly how quickly Dallas can handle a tower at that price point. If anything, this may encourage similar developments with more reasonable expectations and hey maybe even more reasonable prices. I'm still waiting for some "average-man" (or woman) condo prices in a shiny new tower. Tivo_Kenevil wrote: I'm still waiting for some "average-man" (or woman) condo prices in a shiny new tower. Same, I'd be all over that. I'm pretty sure Phase 2 of the statler will contain condos that are in the $300K range, if I'm not mistaken. I'd like to see something in 200K-300K range. We currently have that type of product in the CBD. But I would like to see how new condos priced at that price point would do. A lot of the older inventory doesn't come w/ Parking or you have to rent a space off site. Which in my experience, the Dallas resident has a disdain for. I know some condos in Cedars at this price do well. Of course, they're newer & come with parking on site. I'd like to see some condos in a tower in the CBD with such characteristics. Idk ,Maybe the costs don't allow it. But it would be nice if feasible. Apt > Condo or Hotel > Condo conversions would be the best bet. There are several buildings that would be well suited for conversion, and the fact that you already have people living and paying in the building helps soften the transition. It continues to surprise me that we don't see more of this going on. I realize apartment rates are performing very well, but so are condos. This type of thing happens all the time in other well performing markets. Perhaps Dallas just isn't used to being one, and these folks haven't quite gotten creative enough to try it... not sure. Million-dollar home sales in North Texas are continuing to outpace the market. ...million-dollar sales in the area have jumped by more than 23 percent, with 1,669 during the 12 months ending in November.... Texas real estate agents sold 4,622 houses priced at $1 million or more between October 2016 and November 2017, according to the Realtors. The average per-square-foot sales price of these properties was $349 — up 1.9 percent from the previous year. Local real estate agents say that one reason million-dollar home sales have risen in North Texas is because of years of price increases in the overall market. During the last four years, median home prices in the area have risen by more than 40 percent, pushing a lot of homes into the million-dollar price range. The scene was set, and development in Dallas was in exile, only those surviving local players would have anything to do with the city. Deep Freeze Dallas, Red Hot Collin County and so all the most valuable real estate in the region - central Dallas - was not considered to be worth nearly as much as it actually is. The State put in place laws to preemptively countermand a repeat of the tempting and devastating alliances of the 70s/80s and that help the state survive the most recent recession, and all of a sudden outside folks are interested in Dallas again, the exile has been lifted and in five years median home prices rise 40%. This is just getting back to normal, and it took more than a generation. Museum Tower apartments entered the recovering market at $800 per square foot, more than twice (I think) the price of Ritz, setting the ceiling not just for expensive condos, but estate-homes as well. The pioneer price was not too high for the market, and in a few years this price point will not seems so crazy. Dallas is Hot, and it's getting Hotter. There's no doubt the first 3 or 4 years Museum Tower had been "officially" open the place demands were so far above everything else, it seemed unstable and destined for the lump of other abject failures, but in as little as five years, the region caught up to itself, and took the edge off the once considered ridiculous price of Museum Tower. It's neat to me that some of these milestones are happening about the same time... the regions housing market is what I would consider near normal, close to expectation (after the 40% price reevaluation), Museum Tower hits the *whew-worthy* 80% sold mark, McKinney Ave Area office prices reached 60/sqft -- also would have been crazy unheardof too expensive five years ago. The city is coming back on line. When first opened, Azure was the canary -- for the time it was very expensive and very large. Museum Tower, hopefully, will be the next canary to fly out of the cave. I think we will see this soon, and yes it is surprising we haven't seen more recently. Many 1970s/1980's complexes in North and Northeast Dallas have been converted to condos. Some where during the real estate boom of 2004-2006 too. More recently, the Shelby apartments near SMU have been slowly converted to condo and have sold very well from what I've heard, for high $/sqft. It's the Shelton and there is a good reason they are selling fairly well after an initial very rough start. They just happen to be in HPISD but pay city of Dallas taxes, not many places you can buy for $400k in HPISD, much less fully updated and livable for someone in the market for a $400k house. Apparently there are a LOT of families in the building. Also it wouldn't surprise me if there are a few people claiming their condo in The Shelton as their primary residence for the purposes of HPISD but happen to spend a lot more time at another house. Maybe not but it wouldn't surprise me.